Ken Nattrass, band leader of Scotch Measure, passed away on March 5, 2015 and Scotch Measure subsequently disbanded. And on May 27, 2015, Adam Laird, the former band leader, also passed away. The band has been such a valued and important part of the Winnipeg Branch it has been decided to retain the following history. There is something invigorating and almost sensual about dancing to live music and Scotch Measure has been providing those experiences to the Winnipeg Branch for over 30 years, playing for the Branch’s social and balls. 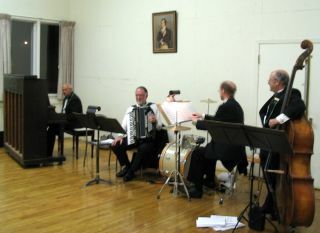 In one dancing season the Band plays on upwards of five or six occasions. More detailed information on the Band is included in the following article written by Ken. Scotch Measure marked its 30th anniversary in 2011. The first meeting of committee and band members took place at Crescent Fort Rouge United Church on November 1, 1981. After playing their way through a few tunes, all agreed to pursue the project of forming a band to play for Winnipeg Branch Socials and Balls. The band adopted the name Scotch Measure at the recommendation of Adam. On the invitation of John Trevenen, Ken Nattrass joined the band on accordion in the fall of 1982. John and Ken had by then enjoyed a musical association since 1977 with the British music-hall group The Bunch of Grapes and the Village Green Morris Men. Jay had also been part of The Bunch of Grapes and had been recommended by John for Scotch Measure. Jane Hawkes played with the band for a couple of years, then married and moved to Ontario. Cathy Shewchuk Nosaty replaced Jane on piano and played with the band until 1985. She had by then become in considerable demand as a composer, musical arranger and children’s performer in a group called Canadian Content and could no longer commit to the band. In 1985, after serving 4 years as musical coordinator of Scotch Measure, Adam took on the added role as pianist. In 1986 Jay was diagnosed with a serious and life threatening illness. After a lengthy but successful period of treatment and recovery, he returned to the band. In his absence, Archie Sharp and Curtis McRae sat in on drums. The band’s membership remained unchanged until 1990 when Helen retired from the band because of ill health. She subsequently passed away in June 1994. Bert Mayes joined the band on fiddle in 1992. He and John played twin violins until early 1997 when John stepped down due to poor health. John passed away in August 2003. By 1997 Marlene Wachko, another discovery of John Trevenen’s, had begun “sitting in” on fiddle at some Socials. She formally joined the band upon John Bowman’s retirement. Bert and Marlene enjoyed a close musical relationship and it was particularly sad for Marlene when Bert had to leave the group for health reasons in 1998. Bert was not only a fine musician, but also a wonderful craftsman. He hand-made nine violins and usually played one of his creations at our dances. Bert passed away in December 2001. At the conclusion of his memorial service, Marlene and Adam played a poignant rendition of Ashoken Farewell. Marlene graduated from the University of Manitoba with a degree in Electrical Engineering in the spring of 2001 and took a job in Toronto. She played her last gig with Scotch Measure on May 5, 2001. The Branch and Marlene each had an opportunity that evening to give thanks to one another for the shared pleasures of music and dance. What wasn’t anticipated was that May 5, 2001 also turned out to be Adam’s last engagement with the band. Not wanting any “fuss” or to steal attention away from Marlene, Adam waited until after the dance and refreshments that evening to gather the members of the band together. He said that, after having given the matter a lot of thought, he had decided it was the right time for him to retire from Scotch Measure. It is difficult to estimate the contribution Adam has made to SCD music in Winnipeg. He and John Bowman transcribed literally hundreds of tunes by hand after searching Scottish music books for just the right tunes to accompany the dances. Adam has also left a legacy of 32 jigs, reels, strathspeys, marches and waltzes that he composed. The band continues to play his compositions in dance sets, not because they are Adam’s tunes, but because they are good tunes. Twenty five of Adam’s compositions can be heard on the CD Skip Change with Scotch Measure recorded in 1997. Adam’s son–in–law Rod Brown, under the label Kirkmuirhill Productions, produced the CD. It is a lasting tribute to Adam’s music. Members of the band are grateful to the Laird family for making that recording possible. Although Scotch Measure has mostly played for Winnipeg Branch functions, the band made its first out–of–town foray to Thompson in 1982. Later, the band was fortunate to be invited to Edmonton in 1989 and 1990; to Kenora in 1994, 1998 and 1999; and to Victoria in March 2001. This last engagement was to play for the 25th Anniversary Ball of the Vancouver Island Scottish Country Dance Society. It was a highlight in the history of the band and a great way for Adam and Marlene to “go out with a bang”. In the fall of 2001 Ken, Jim and Jay had to break in another “rookie” on piano, Ron Krug. Actually, Ron came to the band with a long history of playing SCD music including stints with Angus McKinnon’s band in Toronto and Barbara McOwen’s band in Boston. Ron’s first playing experience was for an examination class conducted by none other than Miss Milligan. The present configuration of the band (accordion, piano, double bass and drums) has continued intact since 2001. Ken took over the music director role when Adam retired and he has been responsible for writing the musical arrangements played by the band since that time. Although the band as a whole has not been “on the road” since 2001, Ken and Ron regularly travel to play for RSCDS Workshops and Balls in Saskatchewan, Alberta and British Columbia. They have also served as staff musicians at TAC Summer School on three occasions. As well, Ron is regularly called upon to play for Teacher Candidate Classes held in association with Summer School. The history of Scotch Measure would not be complete without acknowledging the vital role that John Trevenen played in the formation and ongoing support of the band. Not only was he an elegant dancer and excellent teacher, he was very knowledgeable about SCD music. He always encouraged the band to play with passion and intensity and “never mind the clunkers”. The band and the Branch lost a great friend with John’s untimely passing in September 1996. In the early years the Branch generously provided music workshops for the band bringing in Stan Hamilton (piano) from Toronto and Barbara McOwen (fiddle) from Boston to work with the band. Many years later the Branch sponsored another music workshop, on that occasion with Alex Jappy (accordion) from Delta, B.C. The band has enjoyed 30 years of support and encouragement from the Committees of Management, teachers and members of Winnipeg Branch. Thanks to all! And so, on with the dance. The music will tell you what to do!